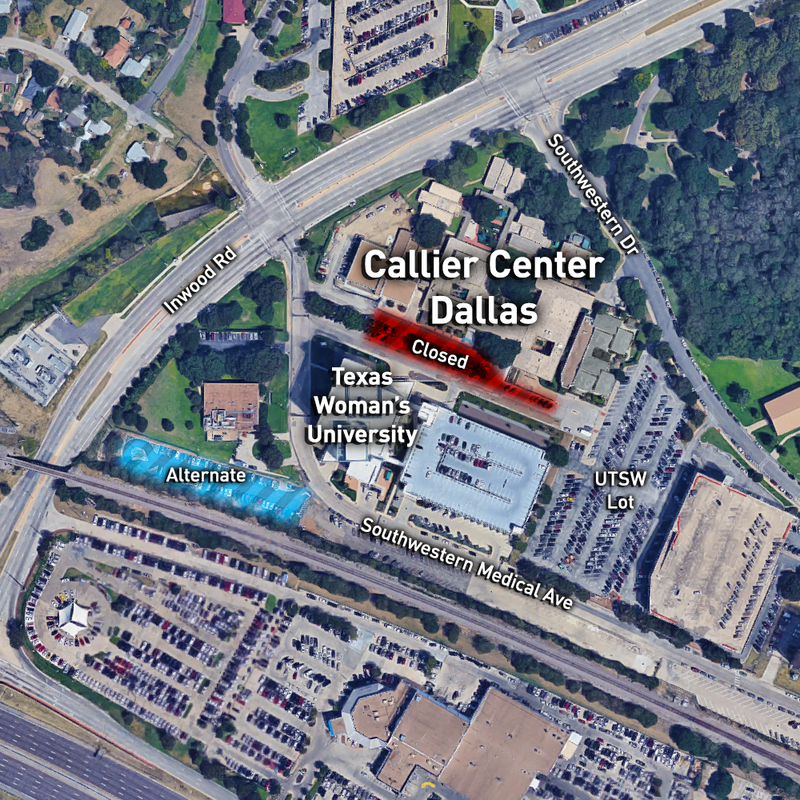 The front parking lot for Callier Center Dallas (CD) will be closed for repairs December 18 through January 27. Weather permitting, a portion of the lot will reopen for parking on January 8. 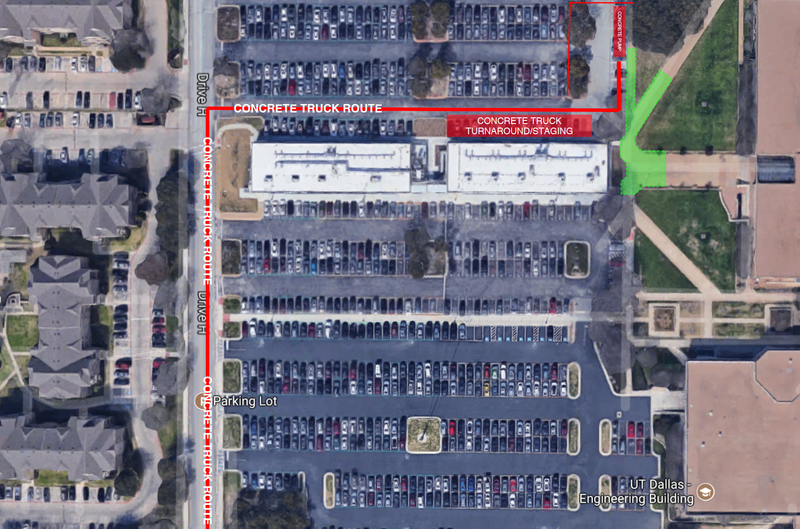 Alternate parking for UT Dallas permit-holders will be available throughout the duration of the project in the overflow green lot off of Southwestern Medical Avenue. To minimize disruptions and inconvenience, UT Dallas has scheduled campus utility outages during winter break to conduct annual maintenance, inspections and cleaning of critical equipment. The central Energy Plant (EP), which affects heating and air conditioning only, will be shut down from 5:00 p.m. Friday, December 22, through Wednesday, December 27. Several campus buildings will be without heating or air conditioning while maintenance work is performed. 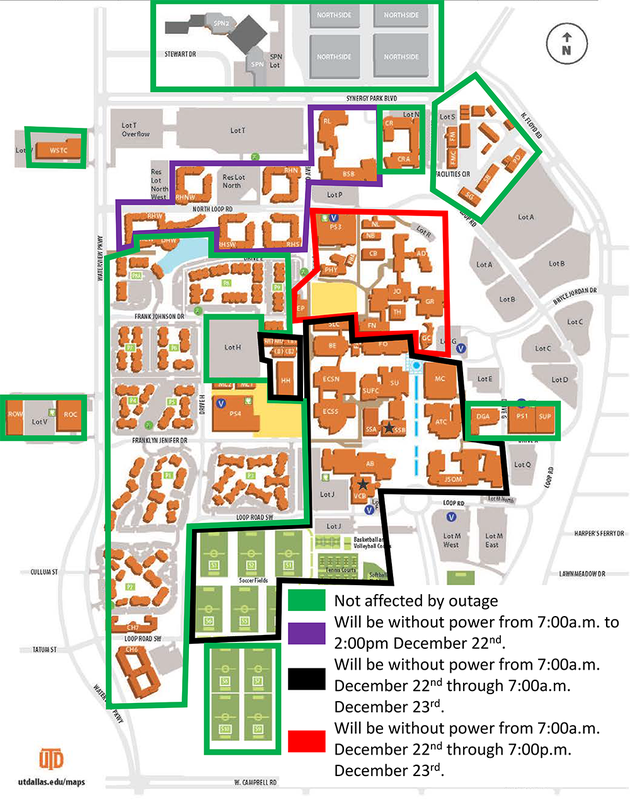 From approximately 7:00 a.m. on December 22 until 7:00 p.m. on December 23, power will be shut down for a significant portion of campus. The areas listed below and indicated on the map will be without power for various durations of time, from seven to 36 hours. Everyone in the impacted buildings is encouraged to take the necessary precautions to ensure equipment will not be affected by the outage. Please make sure all computers and sensitive equipment are turned off to prevent the loss of data or information. For safety, no one will be allowed to enter the affected buildings during the outage without specific authorization from UTD police. Emergency generators will operate normally. Equipment on the emergency circuits will remain powered. Without Power December 22 from 7:00 a.m. to 2:00 p.m. Please check the Pardon Our Progress website for more information about this and other maintenance or construction projects on campus. On November 24, work will begin to install a new water line to support the new Science Building and adjacent existing buildings. Sections of Rutford will close to allow room for equipment, and flagmen will be stationed in the area. Crews anticipate completing the installation by January 3. The street will temporarily open during commencement to assist in traffic control if needed. On December 18, additional areas will close to allow for road repairs and utility work. The area off Frank Johnson Drive, next to apartment building 65 will close until January 5, to allow crews to repair paving in the area in red on the map. 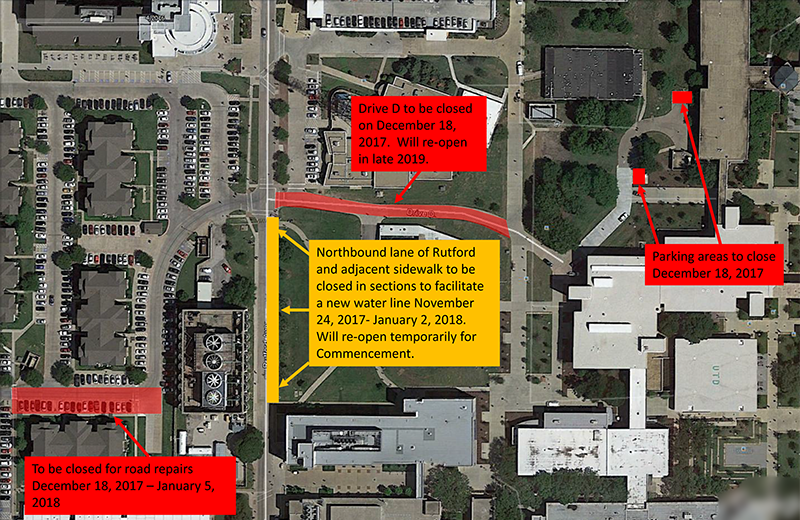 Drive D will also close on December 18 so crews can start underground utility work for the Science Building. Drive D will be closed from December 18, 2017, through late 2019. To further facilitate their work, the two small parking areas west of the Administration Building (AD) will close for the duration of the project. Continue to check Pardon Our Progress for updates. On Monday, November 13 at 9:30 a.m., the City of Richardson will start work on railroad crossing repairs on Waterview Parkway, just south of Frankford Road. Only one lane will be open north and southbound traffic throughout the majority of the project, which is expected to be complete by December 8. Barricades will be setup in the area to aid with traffic flow and control. Please review the campus map and consider taking alternate routes when traveling to campus from the North. 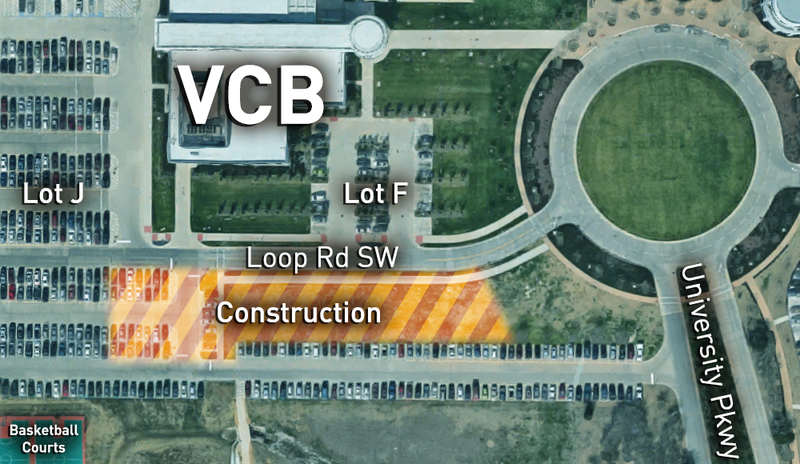 Crews are preparing to construct a bus transit center directly south of the Visitor Center and University Bookstore (VCB) in order to improve traffic flow near the roundabout. Perimeter fencing will be installed around the construction site on November 18, which will temporarily impact some parking spaces and pedestrian paths at the far east end of Lot J. The area is expected to reopen at the beginning of January 2018 when the project is complete. Weather permitting, the transit center will replace the current Comet Cruiser drop-off and pick-up location on the roundabout when it opens on the first day of classes of the spring 2018 semester. Those housed in the affected buildings are encouraged to turn off their computers and clear out refrigerators and freezers by close of business Friday, October 27. On Friday, October 13, crews will begin construction to renovate Drive C, between the Engineering & Computer Science South (ECSS) Building, the Student Services Building Addition (SSA) and the Activity Center (AB). While all main entrances to the surrounding buildings will remain open, Drive C will be closed to pedestrians throughout the duration of the project. Alternate pedestrian paths are shown on the map in green and will be indicated with signage and barricades on the site. In addition, Drive C will close to vehicular traffic from Oct. 18 through Nov. 6. 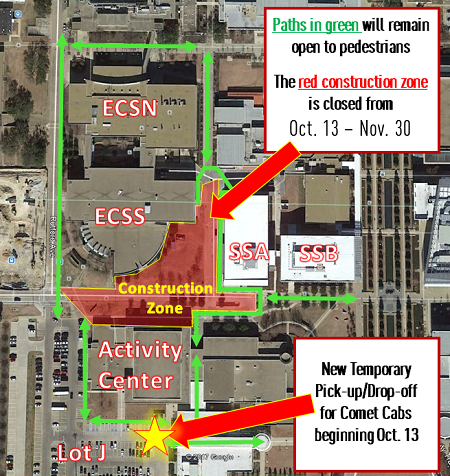 The Comet Cab pickup area for the Activity Center (AB) will also be temporarily relocated to the south side of the building. Weather permitting, the project will be completed by November 30. Parking Structures 1 and 3 will be closed Saturday, September 23, and Saturday, September 30, in order to further the installation of the new electronic parking guidance systems. No parking will be allowed in PS1 or PS3 on these dates as crews will be installing wiring throughout the structures. Please review the Parking Map (PDF [Portable Document Format File] ) for alternate parking locations on these dates. The closest options to PS1 are Lots C, D, E and Q, and the closest options to PS3 are Lots P or T. Both structures will reopen the following Sundays. We appreciate your understanding. Please continue to check this site for updates. As the Administration Building re-roofing project is coming to a close, crews are mobilizing to replace the Activity Center (AB) roof. Contractor fencing and equipment will be onsite throughout the project, which, weather permitting, should be completed in early December. Work will begin on the west side of the building, moving east as the project progresses. All main entrances to the building will remain open during the project. The sidewalk on the north side of the building will be partially closed for approximately two months to allow space for equipment and debris collection. Flagmen will be in place to direct pedestrian traffic as needed, and safety precautions will be strictly adhered to throughout the process. In addition, the project may cause loud noises and strong smells at times due to the required roofing equipment and materials. Please pardon our progress and continue to check this site for updates. Lighting in Lot T Overflow will temporality be down due damaged wiring. Crews are working to make the repairs, which are expected to be complete by end-of-day Monday, September 18. On the morning of Friday, September 1, construction crews will be working to pour back the concrete sidewalks on the west side of Hoblitzelle Hall (HH). Some parking spaces in Lot H near the pour area will be blocked to allow space for the concrete trucks. The spaces will reopen on completion of the concrete pour. Due to maintenance, the fourth and fifth levels of Parking Structure 1 (PS1) will be closed on Friday, August 25. All other levels of PS1 will remain open. Please use lots M, Q, C, and D for additional parking options nearby. Due to maintenance, the third level of Parking Structure 1 (PS1) will be partially closed on August 23, and the fourth level of PS1 will be partially closed on August 24. All other levels of PS1 will remain unaffected. Please use lots C and D for additional parking options nearby as parking will be limited on these levels during these dates. Weather permitting, the maintenance work should be completed by end-of-day Thursday, August 24. Parking Structure 1 (PS1), at the corner of Drives A and G, is currently undergoing maintenance. During this work, PS1 will be close to inbound traffic starting at 10:30 a.m. each day. Exiting traffic will be allowed for those that parked prior to 10:30 a.m. Please use lots C, D, E, or Q as alternate parking options during the temporary closures. Weather permitting, maintenance should be completed by Friday, August 18. Thank you for your patience while we work to improve our campus parking. Lot H will close Wednesday, August 9 before 7:00 a.m. 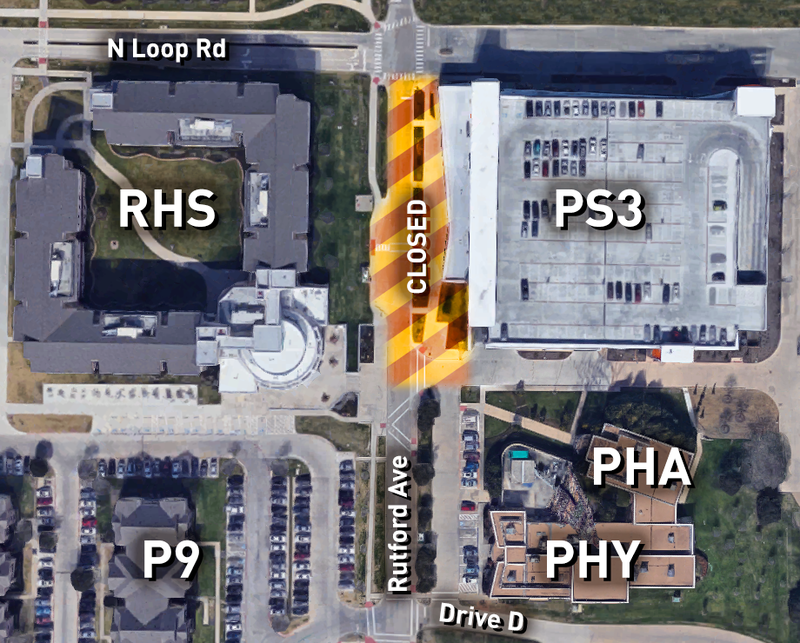 This closure will allow crews to repave, seal and restripe Lot H and repair portions of Frank Johnson Drive which were damaged by utility work related to the Engineering Building construction. Weather permitting, Frank Johnson Drive will reopen to traffic by the end of day Friday, August 18. Also weather permitting, Lot H will be completed by Saturday, August 19. Please use Parking Structure 4 (PS4) as an alternate parking area until the project is finished. We apologize for any inconvenience and appreciate your understanding. For safety, no one will be allowed to enter the affected buildings during the outage without approval from UT Dallas Police. Items being supported by emergency power will remain operational as emergency generators will not be impacted. Starting Friday, June 30, at 1:00 p.m. through Sunday, July 2, at 5:00 p.m., the Administration Building’s (AD) main north entrance will be closed to all pedestrian traffic so that the first set of stone seating benches can be installed on the pavers directly outside the exterior glass doors. Heavy equipment will be used to transport the stone from Lot R to its destination. The automatic-door sensors on the main north entrance will temporarily be disabled and signage will be in place while the work is completed over the weekend. To enter the building from the north, pedestrians should use the side patio glass doors instead. As construction continues on phase 2 of Northside, Oncor crews will be working from June 29 through mid-July to relocate power lines for the development which also supply power to campus. While no power outages are expected as part of this work, students, faculty and staff are encouraged to save their work often to keep data safe in the event an unplanned outage occurs. This week, contractors will begin setting up fencing and equipment to start work on replacing the Administration Building (AD) roof on Monday, June 19. The project is expected to be completed in approximately two months, weather permitting. Work will begin on the west side of the building, moving east as the project progresses. All pedestrian pathways and entrances to the AD building will remain open during the project, aside from momentary pathway closures that may be necessary to move debris or equipment at times. Flagmen will be in place to direct pedestrian traffic as needed, and safety precautions will be strictly adhered to throughout the process. A few handicap parking spaces near the west entrance of AD and a few spaces in Lot R will be closed during various phases of the project to allow adequate room for construction equipment. In addition, the project may cause loud noises and strong smells at times due to the required roofing equipment and materials. We appreciate your understanding. Please continue to check this site for updates. Throughout the summer, maintenance will be conducted on several parking lots to repair damaged asphalt and restripe faded markings. When possible, work will be conducted in sections so other areas of the affected parking lot can remain open during repairs. Please watch for signage and barricades in the affected areas, and review the Parking Map (PDF [Portable Document Format File] ) for alternate parking options. The following is an estimated work schedule, weather permitting. Facilities Management and its departments will be closed May 19 for an internal work day to perform safety checks, maintenance, and inventory updates. If an emergency arises on this date, it will be addressed promptly, but all other requests will be responded to the following business day. Please plan accordingly if you have upcoming events or work requests. In preparation for the renovation of the 2nd floor classrooms in the west wing of the Administration Building (AD), demolition will begin May 19 to clear the rooms for construction. Most of the demolition will be done between 5:00 p.m. and 12:00 a.m. to minimize disruption. Demolition is expected to be completed by the end of May, and construction will commence in June. Throughout this process, the southwest building entrance is expected to remain open for use during regular business hours, however pedestrians may be directed to access the doors from the stairway off of the North Mall at times. Additionally, during the construction phase of the project some of the handicapped parking spaces by the building will be blocked temporarily as part of the construction zone. The entire project is slated for completion in August to be ready for fall the semester. Please continue to check this site for construction updates. Several construction and maintenance projects in progress over the summer will temporarily alter some pedestrian and vehicular pathways. In order to install utility lines for the new Engineering Building, portions of Lot H will be closed intermittently May 13 through August 15. Fencing and signage will be in the area as crews work through the installation in phases. 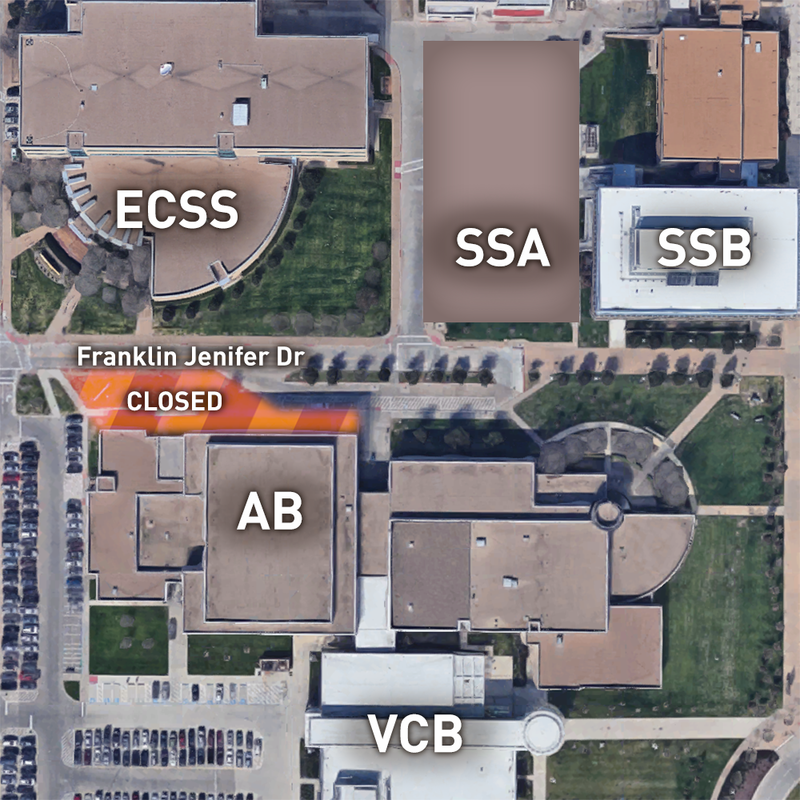 From May 15-27 crews will also be working to extend and connect a telecommunications duct bank to the Engineering Building. During this period, crews will intermittently and partially close Rutford Avenue. Signage will be in place to direct drivers to detour routes. Also on May 15, Rutford Avenue will be closed from 9:00 a.m. to 1:00 p.m. from Loop Road Northwest to Franklyn Jenifer Drive so crews can relocate a transformer which must be moved by crane. Facilities Management will also relocate a generator on the southwest side of the Administration Building (AD) May 16-17. On these days, the handicapped parking spaces and pedestrian paths near the southwest AD building entrance will be closed to allow ample space for large equipment. Please use the north entrances or the south entrance off of the mall instead. In addition, work will begin to replace the Administration Building’s roof June 1. The project will take approximately two months and may cause loud noises and strong smells at times. 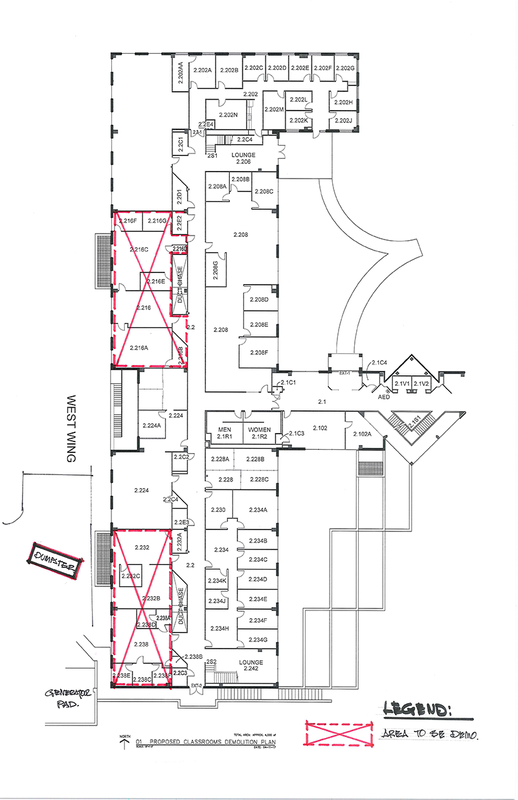 Summer renovations are also planned for the second floor classroom space in the Administration Building, the third floor Green Hall restrooms, and the newly leased space in the Synergy Park North (SPN) building. Preparation for the construction of the University’s next academic building will also begin this summer. The new building will be located on the current site of the Visual Arts Building, and is expected to primarily house science courses. Construction fencing will be placed in the area, but pedestrian and vehicular pathways around the site will remain accessible. Current work and instructional spaces inside the Visual Arts Building will be relocated to the ROC West (ROW) building and a new 6,000 square-foot gallery will be added to the second phase of the Synergy Park North (SPN) building. Additionally, maintenance will be conducted on several parking lots over the summer to repair damaged asphalt and restripe faded markings. The work will be done in phases with various sections of the following lots closing temporary: Lots A, B, C, D, E, G, H, J, L, M, P, Q, R , S, T, U, V, W, and the Armstrong parallel parking. In addition, renovations are planned for the configurations of Drive C and Lot J over the summer. Watch for signage and barricades in the parking lots and review the parking map for alternate parking options. Please continue to check this site for updates on summer construction and maintenance projects. Schedules are subject to change. From 6:00 p.m. on May 12 through May 17, there will be a campus-wide steam outage to allow for scheduled maintenance. During this outage, there will be no hot water or heat in most of the buildings on campus. Dining Hall West (DHW) and Student Union Dining Hall (SUFC) will still have hot water. This outage will not impact cold water, electricity or air conditioning on campus. Please continue to check this site for updates on construction projects around campus. From 6:00 a.m. to 12:00 p.m. on Saturday, March 25, a portion of Rutford Avenue, south of Loop Road to the south access road of Parking Structure 3 (PS3), will be closed to both vehicular and pedestrian traffic. Crews will be using a crane to lift a utility unit to the top of PS3 to support the new Blackstone Launch Pad project, which will be housed in the corner retail space of the structure. During the closure, barricades and road flaggers will be in place to direct both vehicular and pedestrian traffic. 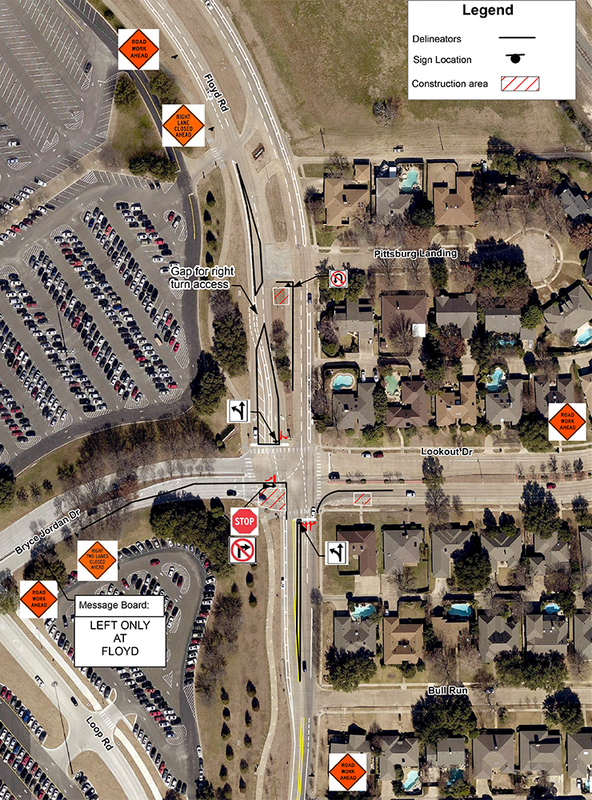 Beginning Thursday, March 23, the City of Richardson will be making an emergency repair to a domestic water line at the intersection of Floyd Road and Bryce Jordan Drive. Lane closures are expected while crews work to complete the repair over the next two weeks. Drivers are encouraged to avoid the area and use University Parkway instead of Floyd Road to access the east side of campus.